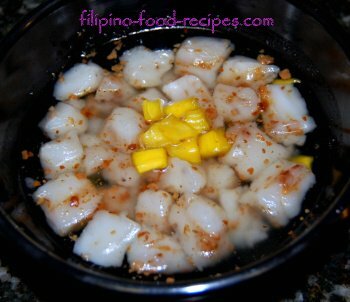 This Filipino sweet rice dessert is a sticky rice cake in a simple syrup or flavored sugar syrup. The sweet rice flour is cooked with coconut milk, sugar and latik or fried coconut curd. Then, the latik is enveloped in the cake rather than sprinkled on top. A simply syrup is cooked separate where the cake bite size pieces are floated to keep them separated, thus, easier to serve. 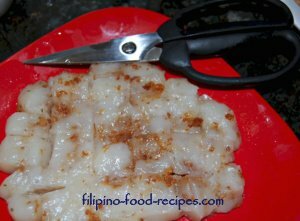 But if you would rather do the Kalamay without the arnibal, see recipe for the plain Kalamay-Kapit here. 1 Make the simple syrup by boiling the sugar and water and flavor with jackfruit. Set aside. 3 Mix the flour, coconut milk and sugar, then strain. Add the anise seed and latik(without oil). 4 Place the mixture in a non-stick skillet and stir until they come together, about 5 minutes. 5 Turn the heat to low, and add a couple tablespoons coconut oil to keep from sticking to the pan. 6 Flatten to 1/4 inch thick and turn or flip over repeatedly every 3-4 minutes, cooking for a total of about 15 minutes. 7 Set on an oiled plate, cut in squares and put directly in the sugar syrup to keep from sticking together. 8 Serve warm or room temperature. No jackfruit? Use other flavor options for the simple syrup : lemon (from lemon rinds), pandan, caramel(brown sugar) or just as it is.